This morning’s training walk was different. The sky was grey, the air was cool, and there weren’t as many people out along Beach Drive and Alki Beach as there had been the past few weekends. Everything felt sort of heavy for some reason. About two miles into my walk, I came across a makeshift memorial and assumed it was for the young man who was stabbed to death on the bike path last week. Police suspect it was not a random attack, and there’s speculation that it was gang-related. Senseless, I thought. Tragic. A mile later, I came across another memorial, this one with a name spelled in candles and spray painted “Rest in Paradise” and other tributes to the young man. Obviously I was wrong about the first memorial. 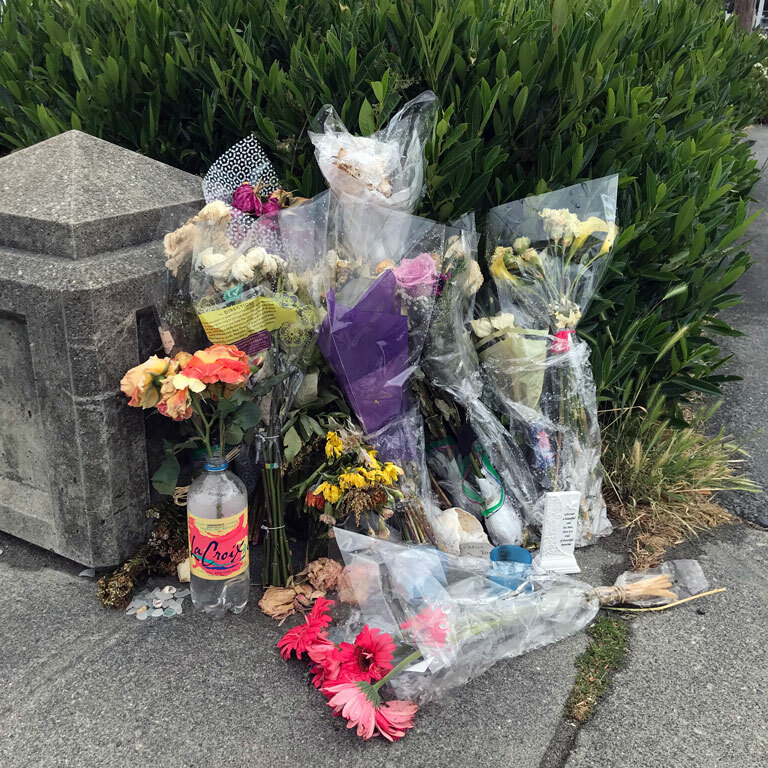 I pulled up the West Seattle Blog and learned that a woman took her own life at that first spot on May 28. Suicide. People close to people I care about. Members of my community. Anthony Bourdain. Kate Spade. Chris Cornell. Chester Bennington. Robin Williams. The list goes on and on. I feel lucky not to have felt so much despair, to have no hope. But today felt really heavy. My mother-in-law passed away suddenly in January. One thing she always did was make sure everyone in her life knew how she felt about them. “Know that you are loved,” is how she signed cards and letters, and often ended phone calls. Her memorial service was filled with memories from the people she loved, and they all knew just how special they were to her. Today I needed to see signs of love. Signs of hope. I found some on my walk. Mile 2: The UW graduate in cap and gown, running back to get something from her apartment while her parents waited in their car. A whole new chapter of her life is about to begin. Mile 3: The father and teenage son who emerged from one of the VRBO houses across from the beach, crossing the street to go for run. “I’ll let you set the pace,” said the father. I hope he continues to let his son set the pace as he grows into a young adult. Mile 4: The young mother, pulling a Bob stroller from the trunk of her car and clicking in an infant car seat before heading down the path. I remembered taking my sons out in our Bob stroller – fresh air for them, and much needed exercise for me. Way to take care of you, too, mama! I thought. Mile 5: My turnaround point was at Kitty Harbor, a no-kill shelter right next to the West Seattle bridge that recently opened an espresso bar to help with operating expenses. We got our tabby Bob here, and my younger son wants to become a volunteer when he’s old enough. Mile 6: The Marine Corp candidates (their hair was way too long for them to be recruits) at Don Armeni park, clothes neatly folded next to “sweat is pain leaving the body” water bottles, doing arm hangs before heading out for a run. They are willingly putting themselves forward to protect and serve our country. Semper Fi. Mile 8: The dozen open water swimmers training in the frigid waters off Alki Beach. They were chatting, smiling, obviously doing something they loved, maybe a little self-deprecating about the absurdity of it. I know the feeling. Mile 8: The 30 or so people getting briefed before heading out on a community cleanup. These volunteers are spending a Saturday morning picking up other people’s trash along Alki Beach. Thank you. Mile 9: The little library I passed on the final stretch of my walk. I regularly contribute books and check out what others have shared, but don’t often take them. Today I saw The Art of Racing in the Rain and remembered how much my sister loved it. I brought it home with me. Mile 10: Alki Congregational United Church of Christ, a 100-year-old church that began sharing its building with the Kol HaNeshamah synagogue seven years ago. They also host Alki Community Council meetings and a number of other community events. Right now there’s a banner on the front of the church reading: “Peace be upon you, our Muslim neighbors.” And also with you, Alki UCC. And finally, you. If you’re reading this, there’s a high likelihood that you and I have met in person. We have connected at some point in our lives, maybe through work, school, children, or cancer advocacy. Maybe we met briefly at a march or an event. We’re probably Facebook friends. There was something about you that made an impression on me, and I want you to know that your presence in my life is meaningful. You matter.